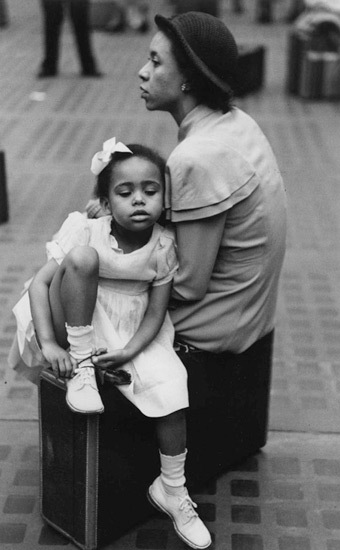 Mother and Daughter at Penn Station, New York City, 1947 - For this and more pictures, visit http://www.orkinphoto.com/children.php. Today seems like one of those days that I’m supposed to pick up on a common theme. Well, a few seconds ago, I figured it out when my bestie emailed me the inspirational start of a story that’s destined for a happy ending. She and her mother are on a journey together to build up her mom’s spirit. And their closeness and today’s triumph reminded me immediately of an interchange my mom and I had this morning. You are such a joy to me. I just want you to know you live up to the renewal of hope your name invokes. Love you. That made me tear up this morning, and it’s making me tear up now. (And on top of the teariness LYH’s email just invoked, I need to chill out before I’m on the extreme side of things I just mentioned!) The relationship between mother and daughter is an amazing one. I’ve spent my life loving my mom and trying to make her proud, and she spent hers trying to make my life exponentially better than hers. At some point, we transitioned from just a parent-child relationship to a parent-child-friends relationship. And now that I’m an adult, I understand the sacrifices she has made, and I worry about her probably just as much as she worries about me. Now, add to the loving and the making proud other things such as checking up on, praying for, trying to prevent worry and stress, defending and threatening on behalf of–all the stuff I owe her for being there for me since even before I was born. Here’s to all the mothers and daughters out there who are ride or die with each other! We could not be where we are without the exceptional love of them, and we’re trying our best to return the favor now. Love you, mama!